I am very happy to post this series "Free Foods - Festive Foods" to support my dear brother Satyajit Rajurkar's online store Sugarfree Sensations . Sugarfree Sensations is a great venture that brings together the best of sugar free and allergy friendly products from all over the world for the convenience of the discerning customer. I hope you enjoy some of these ideas that I endeavour to bring to you from Sugarfree Sensations! Do visit www.sugarfreesensations.com.au to discover more about the world of allergy friendly and sugar free products. Christmas and other festive times are always on those with various allergies or dietary restrictions. Here’s a light beauty for the scorching season ahead. You can even serve it for your Christmas lunch. This salad is quick to make – it’s gluten –free, low-cal, vegan, dairy free and with no added sugar. You can make it fat free too, if you omit the olive oil! What more, you can chop and change all the ingredients – quinoa is a very generous host and will accommodate most salad vegetables and a range of seasoning. Prepare the rest of the ingredients and chill for a while. 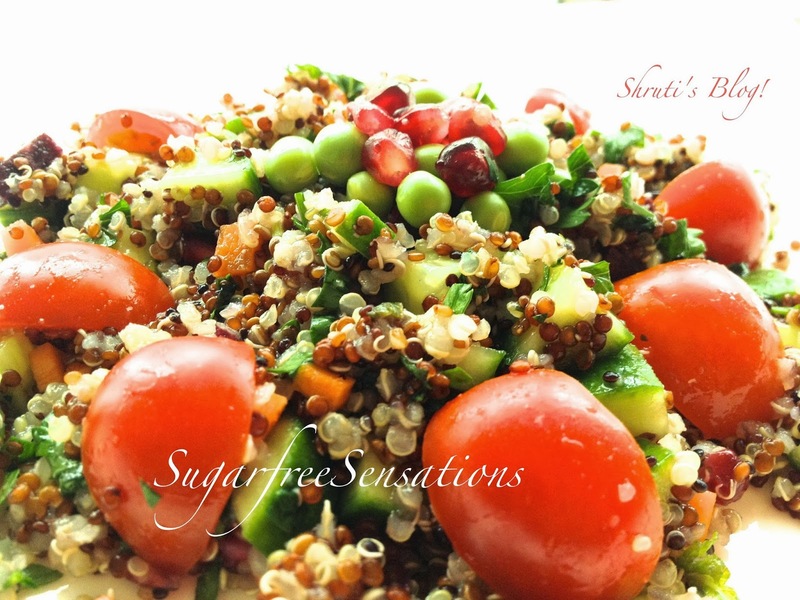 Transfer the quinoa into a salad bowl and stir in the chilled chopped vegetables and herbs. Season with the olive oil, lemon juice, crushed garlic and salt and pepper. Fake it, but cake it!